Slayer is a great skill to train if you want to increase your combat skills on OSRS. Training slayer offers one of the best melee combat experience rate in OSRS. Bonus is added large amount of experience in other skills which you gain while training Slayer. That’s why it’s a worthwile skill to spend time and OSRS gold on. However, it does get pretty annoying to tackle the Slayer grind all by yourself. That’s why OSRS created the option to train with a Slayer partner! It’s also relatively simple – you have to use an enchanted gem, Slayer ring or Slayer helm in order to send a player of your choice a request to be your slayer partner. When they accept, you have to visit a Slayer master to get a task and you will both get the same assignment. But careful! They will only get the same task as you if their Slayer and combat level allows it and they’re eligible for it. A few other restrictions are that you need to have that assignment unlocked and not blocked. If your partner fails to meet any of the criteria, only you will get the assignment and you will receive an announcement about it in the chat box. So pick wisely and don’t play with noobs! 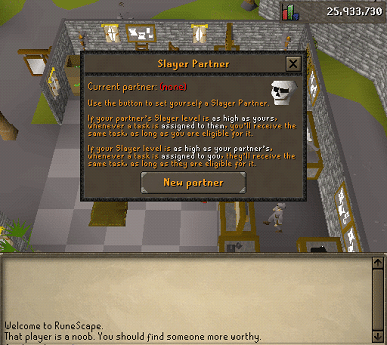 Another restriction about Slayer partner is that it doesn’t work for Iron men. An important thing to know about Slayer partners OSRS is that you share the task, but you don’t share the XP. If your assignment says you have to slay 100 dust devils and your pal slays 50, you still need to kill 100 by yourself. It’s basically like two people doing their tasks by themselves but they have the same assignment so they can go and do it side by side. Aside from XP, Slayer partners also can’t share the amount of monsters they have to kill. To dismiss your Slayer partner all you have to do is use your enchanged gem, Slayer ring or Slayer helm to open the interface any time you want. Many users inquired if they can sell tasks to use Slayer helm or to get extra XP, and it’s not possible because you can’t share a task you’ve been given. Only way to share a particular adventure with a friend is to buy OSRS gold and try Slayer partner together! This entry was posted in How-To Tips & Tricks, Latest OSRS News, Old School RuneScape and tagged buy OSRS gold, buy osrs items, osrs account, OSRS gold, OSRS Mobile, osrs news, slayer partner osrs. Bookmark the permalink.